Last May I was taken out to Pinehurst near Hertford by Dave Binns and Gary Lammin to look at a Bronze Age burial mound in the middle of a housing estate. Dave made reference to a paper he’d written about ‘The Pyramids of Essex’ (or that was how I remembered it) which sounded astonishing. A couple of weeks ago Dave led an expedition to the Bartlow Hills – ‘pyramids of Essex’ – with Gary and I in tow. I’m delighted to be able to publish Dave’s paper on the burial mounds at Bartlow. A video of the field trip can be found at the end of the article. 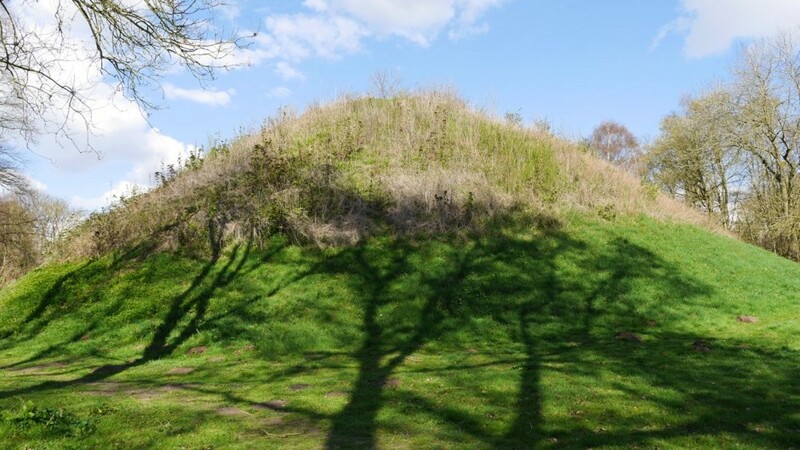 A little known cluster of burial mounds stands to the south of Bartlow village, on the border of Cambridgeshire and Essex. More conical in shape than their prehistoric antecedents, the structures are believed to date from late first and early second centuries AD. That chronology locates their construction firmly within a period (in southern England) of Romanised hegemony, more than a century before the recognised beginning of the uneven, long term decline of Roman material culture. (Foulkner, 2000) In view of the discovery of foundations from a supposed “villa” and other Roman artefacts in the vicinity (Hull, 1963), it is assumed that the mounds were associated with an established residential presence. Initially the mounds present themselves as entirely distinct from the more common flat roadside cemeteries of Roman Britain. As such they provoke reflection on the extent to which relatively indigenous cultural practices continued within the political edifice of empire. The implications of such a line of reasoning are not easy to codify or contain. Even so, one approach to interpreting apparently Romanised mound-building practices would aim to situate them within the dynamic and decay of empire itself. But first, what remains to be seen by travellers to Bartlow? Four of eight (some accounts suggest seven) original barrows have been spared annihilation by the dual assault of agriculture and railway building. The tallest of the survivors, astonishingly, peaks at more than thirteen metres above ground level. In addition to the structures themselves, just sufficient is reliably known to make speculation difficult to resist. Most of the excavated contents were destroyed by accidental fire mid-nineteenth century, but surviving descriptions indicate rich grave goods, pointing to a high status family or group of families. (Dunning and Jessup, 1936) The presence of such apparently elite goods suggests the expanding power of consolidating classes, but how far was the associated cultural nexus specifically Roman in character? An insightful early analysis by Cyril Fox suggests close resemblance between the contents of mounds and flat graves during the Roman period. Discovery of wooden chests and brick tombs in both types of burial implies, for Fox, that mound burial at the time was “…not associated with any particular rite.” (Fox, 1923, p.198) A mound, nonetheless, is not a flat grave. The survival of mound building under occupation complicates the widely assumed image of a systematically Romanised social and political elite. In David Braund’s strong formulation of that conversion model, across lowland Britain in particular, a thoroughly transformed ruling stratum “…competed to display its wealth through imported styles and architectural splendours.” (Braund, 2000) Against that perception, while acknowledging the less rounded profile of the Bartlow mounds by comparison with earlier equivalents, Fox concludes that the former denote “survival” into Roman times of an older cultural custom (Fox, 1923, p.199). Circumstantial evidence including that of accepted chronology provides support for Fox’s hypothesis. Archaeological views converge on the decades around 100AD as the key phase of development at Bartlow. The mounds, to put that another way, were raised just half a century or so after the final military suppression of both the Druid core on Anglesey and the specific tribal insurrection associated with Boudica. The builders of the mounds and most of those whose cremated remains were placed within them were probably closer to Boudica in lived memory than today’s humans are to Winston Churchill or Ho Chi Minh. 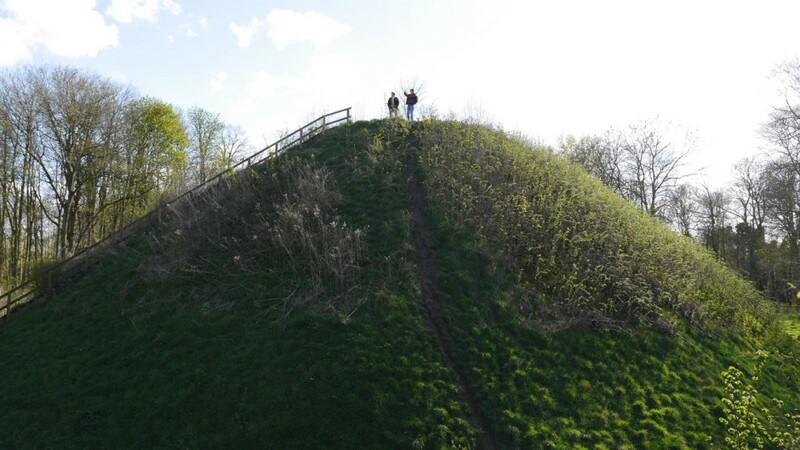 It is even conceivable that the Bartlow mound builders were directly associated with the Iceni tribe that Boudica had come to head, with its substantial territories in what is now called East Anglia a few miles to the north and east. For at least some of those directly associated with the mounds, it seems highly likely – almost inevitable – that recollections and interpretations of what the Roman imperial outlook had disparaged as sub-civilised existence and resistance would, one way or another, continue to reverberate. Over time those memories, like everything else, were subject to change. As the immediacy of the invader onslaught receded, culturally transmitted associations would be reinterpreted and reassessed. Each recollection engendered new adjustments and unexpected tensions. Eventually some multiply reinterpreted memories took on entirely altered significance. 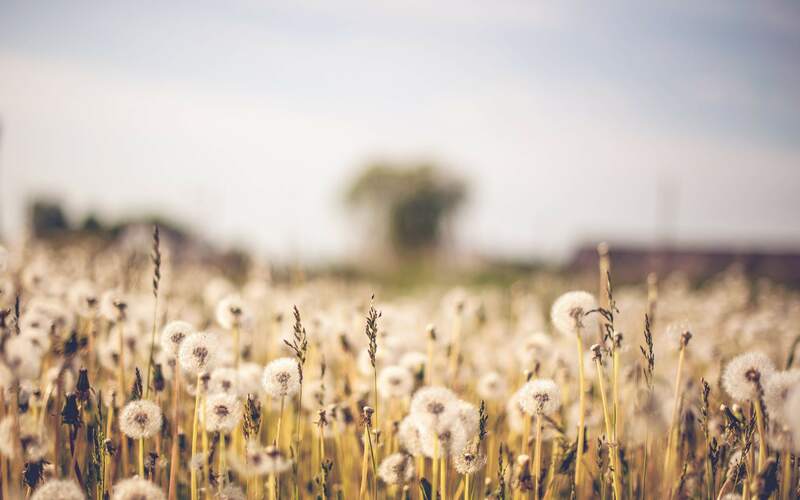 Remembered, but increasingly distant experiences would shift and realign, recombine and reincarnate within difficult-to-recognise manifestations: a battle chant transformed into a children’s rhyme; a curse morphing into a lullaby, or vice versa. The indeterminacy in relation to ethnic identity that James describes has implications for the decades and centuries that followed. Who were the “Romano-Britons” of Bartlow? How “Romano” as distinct from “British ” or “tribal” were they within the universe of their own self-conceptions? From their descendents’ point of view, how, if at all, did Rome’s loss of control in the far west of southern Britain by early fifth century (Jones, 1996) impact upon identity in the south east? Perhaps both most important and most elusive, to what extent did imperial consolidation of the social hierarchy already intensifying before Roman involvement encourage complex, many-sided identities to emerge and in their turn change? Far from assuming some common early or proto-British identity, such questions permit an approach to ethnicity as fluid, shifting and more likely than not at odds with itself. They also raise the potential of people, then as much as now, to be underwhelmed by resistible invitations to hide behind a flag – however often such behaviour is mendaciously theorised as a hallmark of being human. In connection with what is known of Bartlow, artistic and apparently wealth-expressive grave goods are also associated with mound burial in the pre-Roman “Iron Age”. Typical grave artefacts from that earlier period are in addition commonly taken to signify what James Dyer has called “…a strong preoccupation with the after life.” (Dyer, 1997, p.157) However that interpretation is interpreted, there is no doubt that on excavation the Bartlow mounds were found to hold remarkable, even poignant depositions. Archaeologist Alison Taylor writes: “Lamps of iron or bronze had been left burning when each burial was sealed, and when excavated they still contained a ‘fatty substance’ and a partially burned wick.” (Taylor, 1998, p.18) Such an arrangement strongly suggests intentionally prolonged internal illumination after the tombs were sealed. Was the contrivance a means to enact some conception of conscious continuity across the transition to another world? Was there, perhaps in addition, some recognition of the tendency of light – literal or metaphorical – toward eventual extinction? What precisely did that aspect of entombment signify to the people who witnessed it with anguish, relief, indifference, even curiosity? The poverty of available facts is an unavoidable element of the situation. Imagination, it follows, must play a part in any attempt to account for the meaning – or meanings – of the flames of the Bartlow lamps to those who placed and observed them alongside the human remains that they illuminated briefly. Ambiguity pervades all possible theorisations of those perishing flames which could even, in the end, be the most relevant metaphor for the changefulness and multi-potentiality of identity and ethnicity. 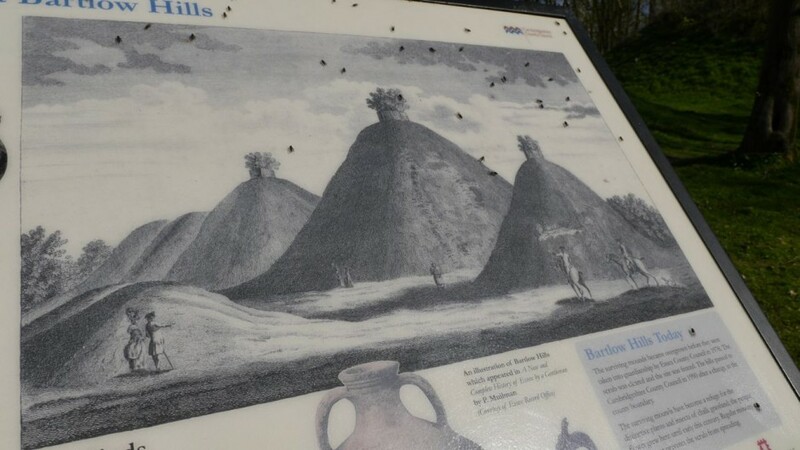 Certainly the presence of Bartlow’s towering “fairy hills” – as ancient and prehistoric barrows have been popularly visualised and imagined (Harte, 1997) – lends an otherwordly quality to the landscape of which they remain a part. Much as with the mounds of Neolithic and Bronze Age centuries, it seems unlikely the creation of that experience of “otherness” is an unintended consequence of landscape transformation. Go among them and to this day you enter another kind of space. Braund, D. (2000) “”Britain AD”, “History Today”, Jan. 2000. Collingridge, V. (2006) “Boudica”, Ebury Press/Random House, London. Dunning, G.C. and Jessup, R.F. (1936) “Roman Barrows”, “Antiquity”, 10. Dyer, J. (1973) “Southern England: An Archaeological Guide”, Faber and Faber, London. Dyer, J. (1997) “Ancient Britain”, Routledge, London. Faulkner, N. (2000) “Decline and fall”, “British Archaeology”, 55, Oct 2000. Fox, C. (1923) “The Archaeology of the Cambridge Region”, University Press, Cambridge. Harte, J. (1997) “Hollow Hills”, “At the Edge”, 5. Hingley, R. (2005) “Freedom Fighter – or Tale for Romans?”, “British Archaeology”, 83, July/Aug 2005. Hull, M.R. (1963) “The Bartlow Hills” in “Victoria History of the Counties of England”, ed. R.B.Pugh “A history of Essex” vol. 3, University of London Institute of Historical Research/Oxford University Press. James, S. (1999), “The Atlantic Celts: Ancient People or Modern Invention?”, British Museum Press, London. Jones, M. (1996) “Rebellion remains the decisive factor”, “British Archaeology”, 20, Dec. 1996. Laycock, S. (2006) “Britannia: the threat within”, “British Archaeology”, 87, March/April 2006. Taylor, A. (1998) “Archaeology of Cambridgeshire Vol 2: South East Cambridgeshire and the Fen Edge”, Cambridgeshire County Council.